Courted By The U.S. And Russia, Uzbekistan Ignores Critics : Parallels Uzbekistan has been a key partner for the U.S. in the Afghan war. Now that the U.S. role in that war is winding down, will Uzbekistan's poor human rights record become more of an issue? Uzbek President Islam Karimov looks on as Russian President Vladimir Putin, unseen, speaks to the media after talks in Moscow in April 2013. Even as tensions have grown between the United States and Russia, both countries have worked with an autocratic leader who rules a strategic nation in Central Asia. 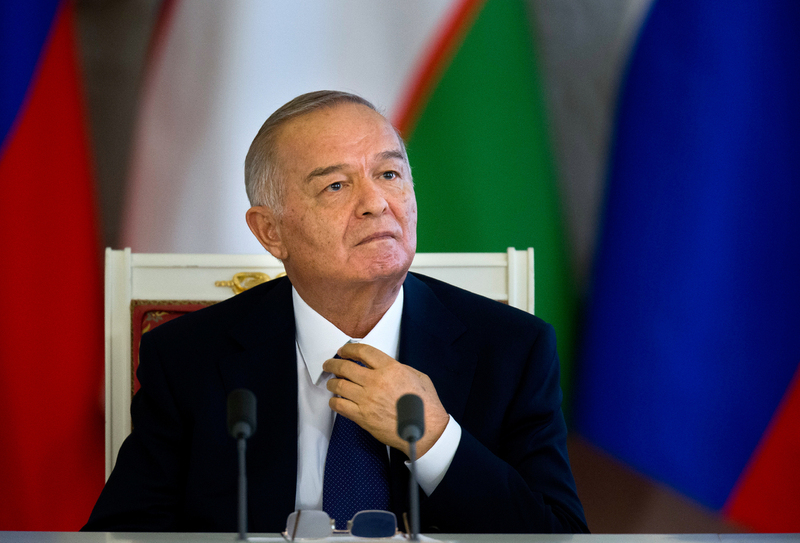 The country is Uzbekistan, and the leader is Islam Karimov, the 76-year-old former Communist Party boss who has been president since the collapse of the Soviet Union in 1991. Despite a long record of human rights violations, Uzbekistan has been a key partner for the United States during the Afghan War. Uzbekistan's atrocious human rights record is no surprise to anyone. Some of these prisoners have been languishing behind bars for no other reason than peacefully exercising their right to free speech. As U.S. involvement in Afghanistan winds down, human rights groups want Washington to take a tougher stand against Karimov's abuses. Amnesty International has called Uzbekistan "one of the world's most authoritarian states." Human Rights Watch issued a report last fall, detailing what it says are severe human rights violations, especially for political prisoners. "Uzbekistan's atrocious human rights record is no surprise to anyone," says Steve Swerdlow, the organization's researcher for Central Asia. "Some of these prisoners have been languishing behind bars for no other reason than peacefully exercising their right to free speech." Swerdlow says Karimov has used the prison system to crush his opponents. "Political prisoners in Uzbekistan are not only suffering torture," he says, "but also experiencing solitary confinement and a very cruel policy of extending their sentences for years and years and years on absurd, farcical grounds." Swerdlow cites the case of Murod Jaraev, an opposition politician who has been imprisoned since 1994. "Since that time, he's had his sentence extended, often on extremely absurd grounds," he says. "One was this ground of 'improperly' peeling one's carrots in the prison kitchen.' "
Following a trial without any due process, Swerdlow says, Jeraev received an additional three to five years in prison. In some cases, rights groups say, Uzbek opposition figures have been abducted in foreign countries and brought back to Uzbekistan for trial. Muhammad Bekjanov is a case in point. 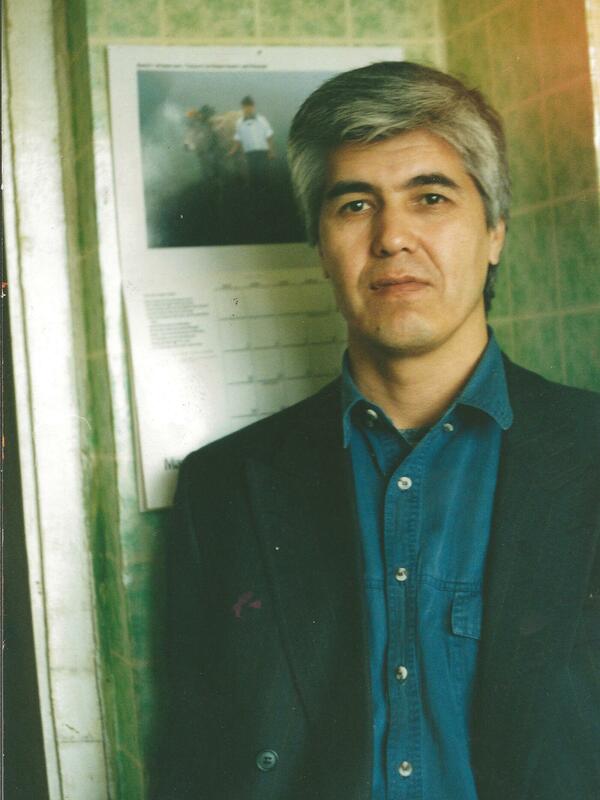 Editor Muhammad Bekjanov has been in an Uzbekistan prison since 1999, according to Human Rights Watch. Bekjanov edited an opposition newspaper, challenging the Karimov government on issues such as child labor and corruption. His family says government threats forced them to flee the country and move to Kiev, the capital of Ukraine. Bekjanov continued to produce an opposition newspaper that was smuggled back into Uzbekistan until 1999, when he suddenly disappeared. His daughter, Aygul Bekjan, says that she and her mother came home to find their apartment ransacked. "They just came and grabbed him and transported him to Uzbekistan," she says. "We didn't know what happened to him." "Just a couple of months later," she adds, "we learned he was tortured, he was beaten, he was going through all these horrible, horrible, horrible things." Bekjan and her family now live in Spokane, Wash. Only her mother has been allowed to travel to Uzbekistan and visit her husband in prison. Aygul Bekjan says her mother saw a man who looks much older than his 60 years. "He contracted tuberculosis, liver disease. Of course from torture, he has broken bones, his arm was broken in a few places and his leg was broken in a few places," she says. Both the U.S. State Department and the U.N. Human Rights Committee have reported that torture and abuse are common in Uzbek prisons. But for years, the United States has provided aid to Karimov's government, largely to secure a critical route for transporting supplies to Afghanistan. Nisha Biswal, the U.S. assistant secretary of state for Central Asia, visited Uzbekistan last month. For the first time, she says, the talks on human rights issues included local human rights groups, a development that she calls a breakthrough. "We absolutely have talked about the specific cases of individuals that Human Rights Watch and other organizations, as well as we put in our human rights report, to urge some sort of amnesty or clemency, on humanitarian grounds, for these individuals to be released," Biswal says. But she adds that Uzbekistan is still vital to stability in Afghanistan, providing it with electricity and a vital rail link. U.S. troops are scheduled withdraw from Afghanistan by the end of 2016. In the meantime, Biswal says that despite "deep human rights concerns," it's better for the U.S. to remain engaged with Karimov. "It's a combination of the right balance of pressure, partnership and a certain amount of strategic patience in how change can take place," she says. Russia also has been shoring up its relationship with Karimov. President Vladimir Putin visited in December, amid announcements that Russia would forgive $865 million of Uzbekistan's debt. Putin said Russia shares Uzbekistan's concerns about Islamist extremism making its way from Afghanistan after NATO withdraws. He called Uzbekistan Russia's "priority partner" in the region. Human Rights Watch's Swerdlow agrees that Uzbekistan is important, but says a country that's ruled by fear and human rights abuses will be an unstable ally in the future.